A group photo of the RAFB employees, shown with base and University representatives, who took the career toolbox professional development course through MGA's Continuing Education department. Keyona Reed jumped at it when her supervisor at Robins Air Force Base offered her a chance to take a short-term career development course at Middle Georgia State University. "Eventually, I hope to get into a supervisory position myself," Reed, an inventory management specialist at Robins, said in early November on the last day of the class, which met every other Wednesday for 10 weeks at the University's Warner Robins Campus. "It was well worth it." 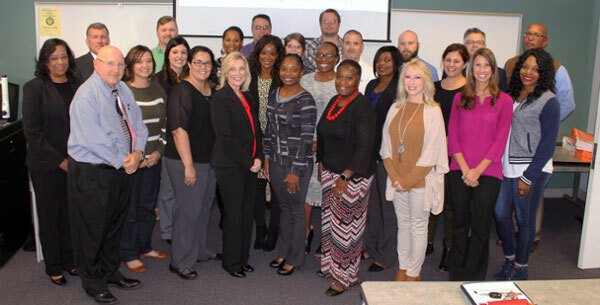 The professional development course, "Filling Your Career Toolbox," was the first offering of Middle Georgia State's newly revived Continuing Education department, which Dr. Kevin Cantwell, associate provost and dean of Graduate Studies, is overseeing. About 25 base employees took the course, which was the result of an idea originating with Col. Lyle Drew, the 78th Air Base Wing commander at Robins, and Dr. Christopher Blake, Middle Georgia State (MGA) president. Another professional development course for base employees that will focus on cybersecurity is scheduled to begin in December on the Warner Robins Campus. "These courses represent a renewed partnership between Robins and Middle Georgia State," Cantwell said. "We have a shared commitment to the citizens of Georgia and the extended family of the Department of Defense to train its workforce and strengthen the base's profile as a highly productive partner in the nation's defense." Retired Army Col. Bill Carty, now an MGA adjunct instructor, taught the "Filling Your Career Toolbox" course. He brought with him years of experience leading men and women in military command assignments throughout the world. Among the topics Carty focused on was time management and prioritization, something all supervisors must constantly juggle. "I took a wide range of professional management and leadership techniques and taught them in an application-based format so (the students) can immediately use them," he said. "We discussed specific situations at their workplace." Most of the base employees who took the course work with the 638 Supply Chain Management Group, directed by Kim Herren. "The verbal feedback I've gotten from them has been very good," Herron said. "Word spreads pretty fast (among base employees) so if this group liked the course we should have a lot of interest in the next one." One of the career toolbox students was James "Tom" Sheridan, who is now working as an inventory manager lead at the base after a 26-year Air Force career. He said Carty's instruction is helping him transition from military to civilian leadership. "There's a big difference between the civilian and military workforce as far as leadership but people who work for the government still have to take an oath to defend the Constitution and support the mission," Sheridan said. For more information about these career development courses for base employees or other Continuing Education initiatives, contact Dr. Kevin Cantwell at kevin.cantwell@mga.edu.